of reproduced sound in the home? Sound quality is judged by the realism of the auditory illusion, which is created in the listener’s mind, created from the sounds coming directly from the loudspeakers and by reflections and reverberations from the room, arriving from various directions and with different timings. The original sound streams from the musicians - performing in their acoustical environment - to the listener in his home have undergone significant changes in processing over the last 50 years, leading to dramatic improvements in dynamic range and bandwidth due to digital technology, but also to new forms of distortion. Electro-acoustic transducers have kept up with the developments. But loudspeakers built with those transducers have only marginally improved, especially when tasked to create a convincing aural scene, which takes the listener to the recording venue space in a typical size living room. 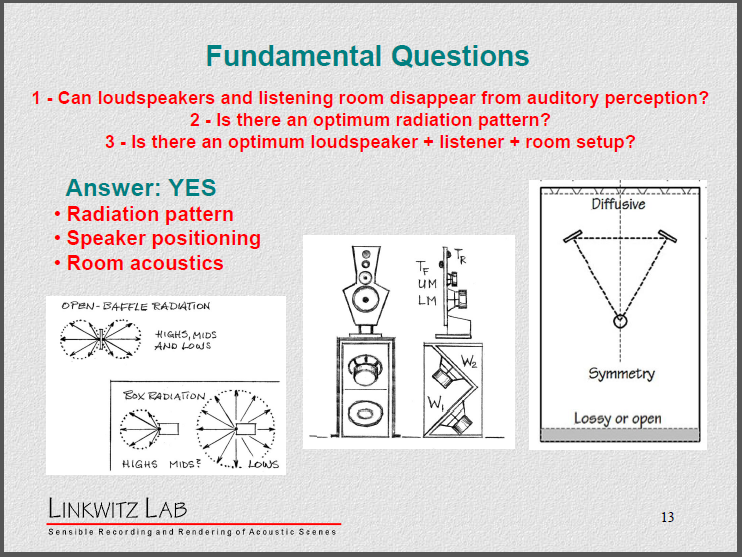 The interactions between loudspeaker, room and hearing processes have not been sufficiently studied and premature conclusions have been drawn about loudspeaker design parameters. The typical loudspeaker comes with fundamental flaws, which critical listeners try to correct by room treatment. The solution would be a loudspeaker with spectrally neutral radiation in all directions. Such loudspeakers are extremely rare. In general, the quality of reproduced sound in the home has reached a plateau that is uninspiring to the Apple and Google generation. 1) Whatever happened to the quality of reproduced sound in the home? How close have we come to creating the illusion of a live acoustic event in the home? And in particular if we try to create this illusion from two loudspeakers in a living room? Stereo is an auditory illusion created in the mind by the sound streams coming from left and right loudspeakers and by reflections of those sounds in the listening room, and by the room reverberated sounds. Stereo is like a magic trick, an auditory trick that is experienced with closed eyes. If it is well done, then the listener is not aware of the speakers or his room and he has the illusion of a phantom stage in front of him, hearing into a concert hall or having the musicians right there. Whatever happened to the quality of the auditory magic trick over the last 50 years? 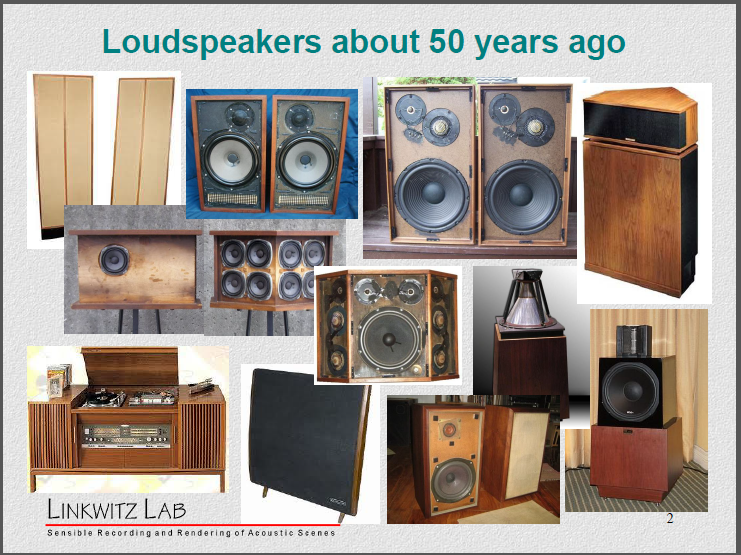 I picked a 50 year time frame because that is how long I have been involved with loudspeakers as a hobby, to satisfy my personal needs and expectations. My professional career has been with Hewlett-Packard Company, with 37 years in Research and Development of electronic test equipment. Audio was an interest amongst many engineers and we designed and built our own Hi-Fi systems. Here we see a high-end loudspeaker console from the late fifties and a contemporary high-end loudspeaker. Did sound quality, the believability of the auditory illusion improve over the years? At the time high-end audio had moved away from the integrated Stereo console (Musiktruhe in German) to a component stereo system. The console was a piece of living room furniture that had combined the stereo speakers with an AM/FM radio, a record player and a tape recorder. Note the variety in types of transducers, of cabinet shapes and how transducers are placed on the baffle. Why these differences? Being an engineer I had a strong desire to understand the technical reasoning. We were somewhat familiar with electromagnetic antenna design in the 20 MHz to 20 GHz frequency range, which is the same wavelength range as 20 Hz to 20 kHz in acoustics. The Celestion Ditton 10 was a small speaker that could be equalized with active filters. It also had a small cabinet and thus fewer secondary radiation issues. The Quad ESL63 sounded neutral, detailed and open, but lacked bass output volume. With the large diameter tweeter section it was also beaming and critical to place optimally in the room. I thought it should be possible to design a speaker that has all the good qualities of the Quad and removes its short-comings. 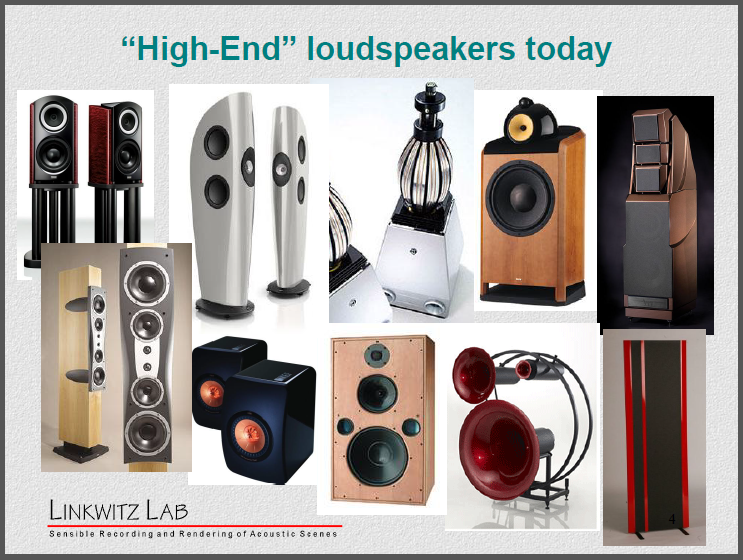 "High-End" loudspeakers today carry a strong resemblance to the designs from 50 years ago. But in general the prices have sky-rocketed and cabinet sizes have increased. But have these speakers increased the quality of the illusion or are they merely capable of higher sound levels and lower non-linear distortion? Is this much variety of design approaches necessary? What are the design goals? >> Before we look at these loudspeakers more closely we must briefly look at what happened to the quality of the stereo signal due to process and material changes in the signal path from recording to loudspeaker. 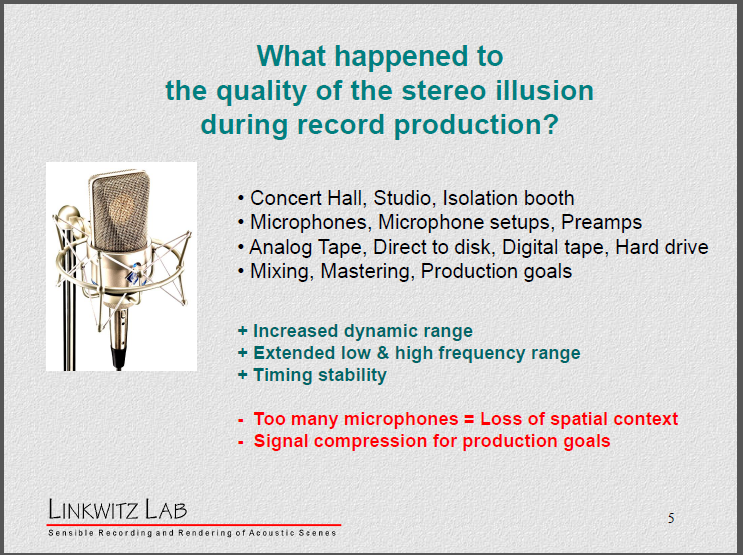 5) What happened to the quality of the stereo illusion during record production? During recording and record production we have the influence of the concert hall, or the recording studio, or the isolation booth, the microphones and their setup, upon the spatial information that is being picked up. These acoustics have not changed in the last 50 years..
Analog tape and direct-to-disk are things of the past and so is digital tape. Today everything is recorded to hard drive. And then there are changes in mixing and mastering practices and in production goals. On the negative side, there is the use of too many microphones and as a result of that a loss of coherent spatial information. And then there is the heavy use of signal compression to make it sound loud. 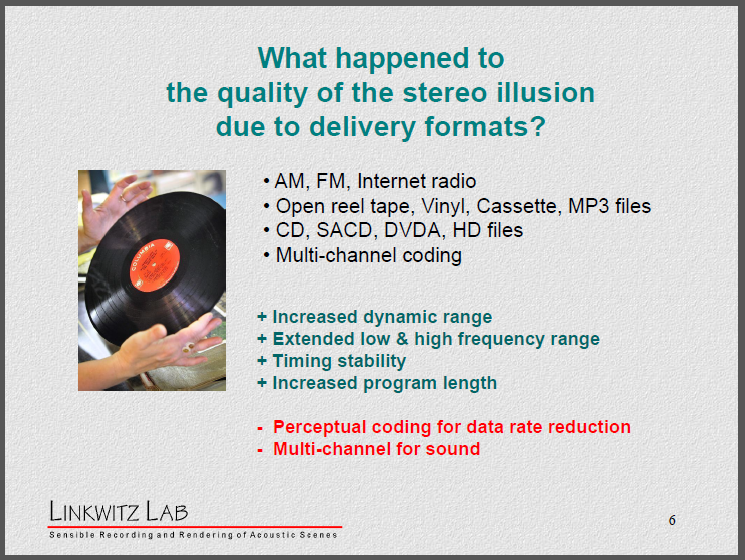 6) What happened to the quality of the stereo illusion due to delivery formats? AM and FM radio have been replaced by internet radio. Open reel and cassette tape are gone, but vinyl is hanging on though it is very limiting for producing highest quality playback. Digital disc formats and digital streaming of high-definition content should by all rights become quality standards. But the digital world also has produced lossy coding and the concept of "good enough"
And then there is multi-channel for sound reproduction, when the capabilities of stereo have not even been fully understood and exploited. Multi-channel is fine for theatrical effects but rather crude for music surround. 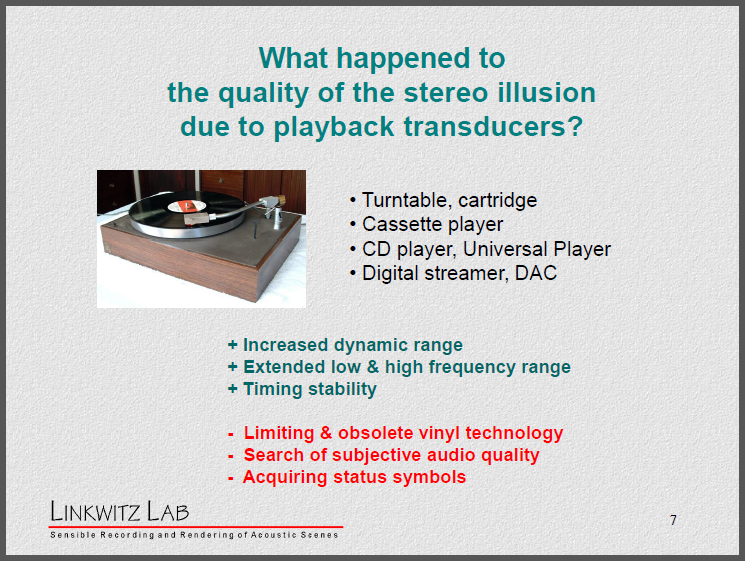 7) What happened to the quality of the stereo illusion due to playback transducers? Each delivery format requires its own transducers to regenerate an electrical signal that can be amplified and applied to the loudspeaker. Turntables and cartridges have reached the pinnacle of their performance, but are ultimately limited in their capabilities. With digital transducers we have the potential for increased dynamic range, like live music, and for its full frequency range, timing precision and clarity. With old technologies like vinyl still around we have a never ending but commercially profitable search for subjective audio performance. 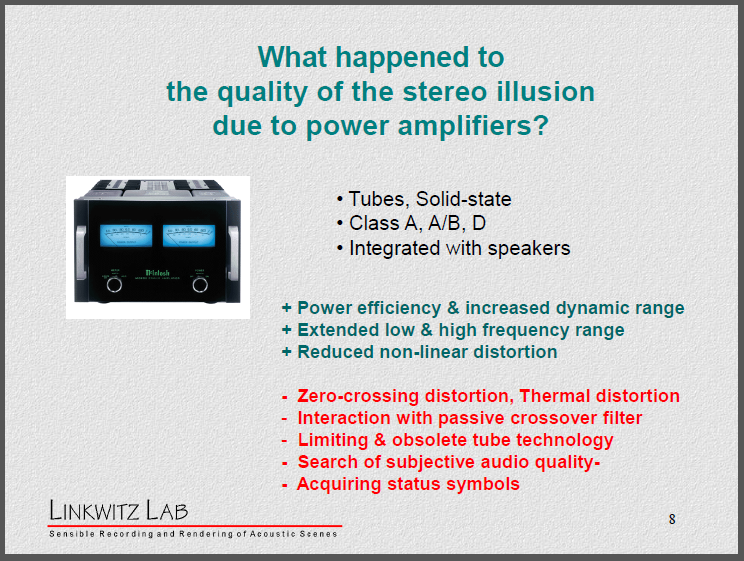 8) What happened to the quality of the stereo illusion due to power amplifiers? Here we have seen changes from vacuum tubes to solid-state devices, to Class A, Class A/B and now Class D pulse modulated amplifiers. In professional circles amplifiers are often built into the loudspeakers. and well designed feedback reduces non-linear distortion. On the minus side we have new forms of distortion from solid-state devices because they are inherently much faster and wider bandwidth devices than vacuum tubes. The nastiest distortion can be caused by the zero-crossings of the output signal when the operating point shifts dynamically because the thermal feedback loop cannot respond fast enough. Also there can be interactions between the amplifier and the passive crossover in the loudspeaker. Tube amplifiers are still popular because their distortions are benign and designing a top notch solid-state amplifier is a challenging engineering task even today. All this supports the search for subjective quality and acquiring status symbols. 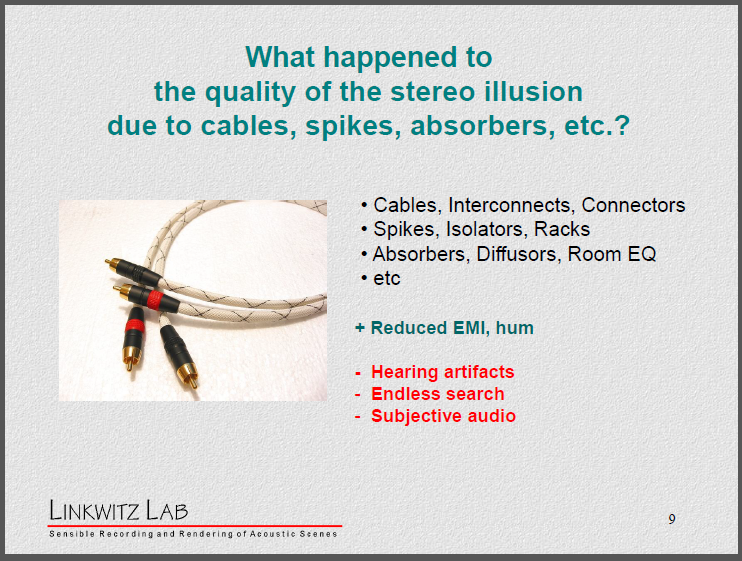 9) What happened to the quality of the stereo illusion due to cables, spikes, absorbers, etc.? All of the devices between microphone and loudspeaker have to be connected with cables that should be shielded against radio frequency interference pickup and hum. Instead a whole new industry has sprung up to change the sound - whether real or imaginary - by exploiting weaknesses in the interface design of audio equipment. Spikes, isolators and equipment racks may reduce the transmission of mechanical vibrations and re-radiation by large room surfaces and can reduce mechanical feedback. Absorbers, diffusers and electronic room equalization will change the sound, but these are only remedies to an improperly designed loudspeaker. 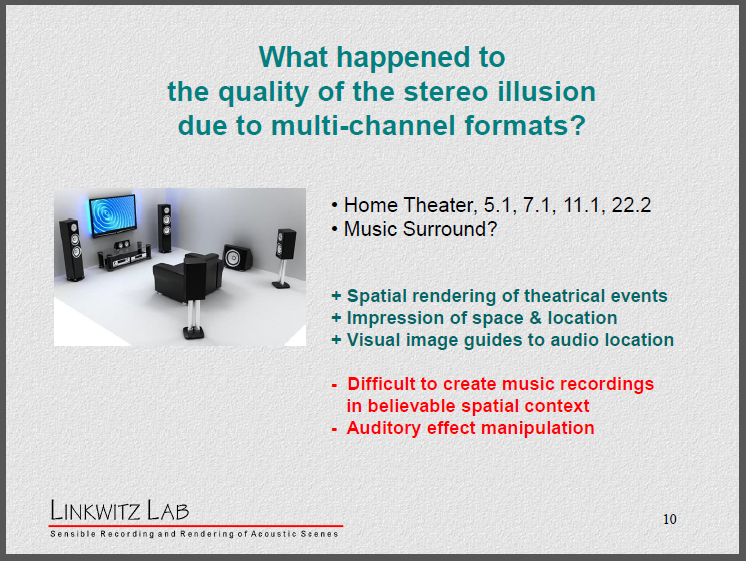 10) What happened to the quality of the stereo illusion due to multi-channel formats? Multi-channel sound is driven by the home theater experience. If the movie industry and broadcasters have their way then the standard 5.1 setup will go to 7.1 channels, 11.1 and 22.2 channels. I question the applicability and need of such systems for music reproduction and only want to point out that it is difficult to create musical recordings where the many loudspeaker channels create a believable spatial context. Our brain is very clever in recognizing what is artificial. >> Let’s look at loudspeaker design first and then at the room where the loudspeaker ends up, and where we judge the quality of the recording and the whole signal chain. So what happened to the quality of the stereo illusion due to loudspeaker design? 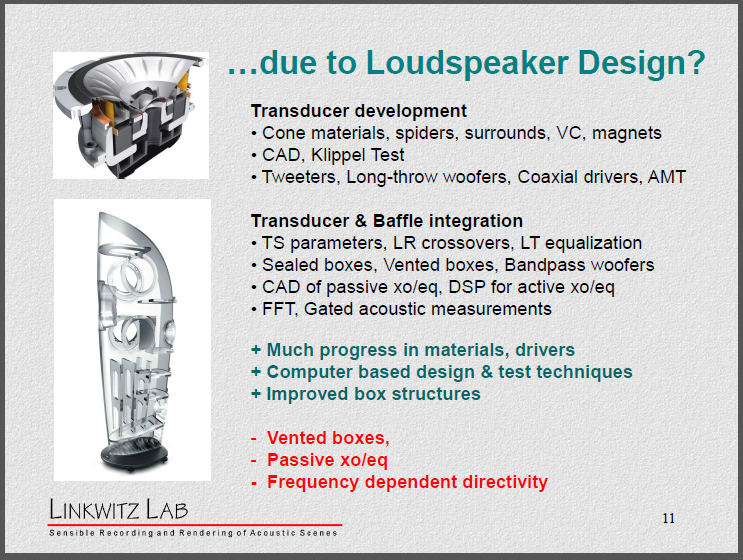 So when looking at loudspeaker design and in particular transducer development. I do not need to tell you at ALMA that enormous progress has been made in development and manufacturing of cone materials, spiders, surrounds, voice coils and magnets. Computer aided design and test lead to application optimized transducers , such as super-tweeters, long-throw woofers, coaxial drivers, air-motion transformers, etc. c) from vibrations of the baffle surfaces. Much progress has been made in our understanding of electro-mechanical and acoustic design. Many computer based tools and computer models are readily available leading to a much higher level of loudspeaker design than was possible before. 1 - Vented boxes. They introduce group delay distortion and color the bass. 2 – Passive crossover-equalizers. They decouple the power amplifier from the transducer and give up motion control. They interact with the transducer. 3 – Frequency dependent directivity. Box loudspeakers radiate omnidirectional at low frequencies and beam at high frequencies. They feed more energy at low frequencies into the room’s reverberant field than at high frequencies. >>> Why should the off-axis response of the loudspeaker matter? It determines how the room becomes engaged with the stereo illusion. Whatever happened due to loudspeaker and room research? 12) … due to Loudspeakers and Room research? Much research has gone into understanding the effect of room reflections upon the perceived location of a phantom source and upon the spatial representation that is generated by a pair of loudspeakers. The Eureka Project and the Archimedes project were industry and academia sponsored research projects. The Audio Engineering Society has published many research papers and organized Conventions and Conferences to exchange and spread new knowledge. My own investigations of loudspeakers and how they interact with my listening room have led me from acoustically small box designs to acoustically small open-baffle designs in an effort to improve the stereo illusion. I was fortunate in not having to design commercial and marketing driven products. I only had to please myself … and my wife, who has additional criteria for accepting new speakers into our living room. >> In the course of my loudspeaker developments I have raised 3 fundamental questions, for which I have not seen a scientific answer, but for which I have lots of empirical evidence. What are these fundamental questions that are so important to creating a believable stereo illusion? 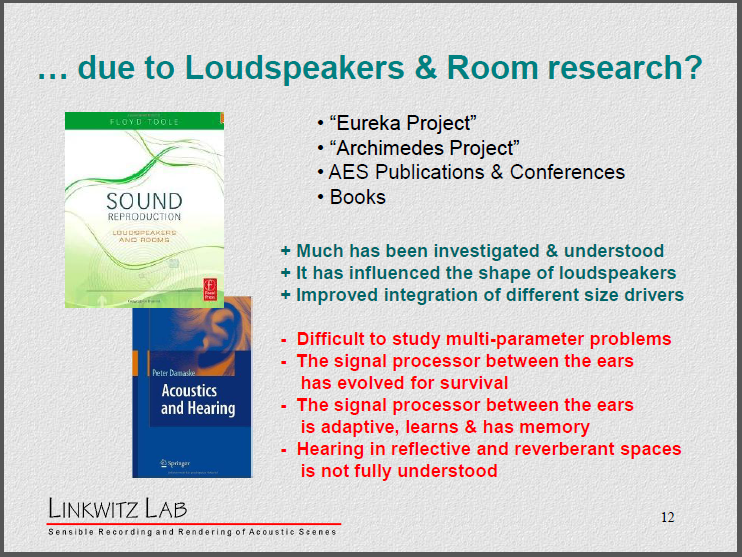 1 - Can loudspeakers and listening room disappear from auditory perception? 2 - Is there an optimum radiation pattern? 3 - Is there an optimum loudspeaker + listener + room setup? My answer to all 3 questions is YES! 1) Loudspeaker and room can disappear from perception, leaving only a phantom auditory scene in front of the listener, provided that the loudspeakers have essentially frequency independent directivity and provided that they are set up in the room with some distance from large reflecting surfaces, That way the reflected and reverberated sounds in the room have the same tonal character as the direct sound but are delayed such that the brain focuses on the direct sound and creates the illusion. 2) Here you see the sketch of an optimum directivity loudspeaker. It is a dipolar radiator from the lowest bass to the top of the frequency range. Its radiation pattern is essentially a constant figure-of-eight at all frequencies. The typical box loudspeaker is omnidirectional at low frequencies and becomes more and more directional at high frequencies. The optimum setup is symmetrical with respect to reflecting surfaces with the loudspeakers at some distance from them. The sweet spot is at the apex of the equilateral triangle, So nothing is new here, except that the sweet spot becomes very wide. The sound does not change when listening at greater distance or off-axis. Only the precision of imaging changes. The listening room itself is optimized by being diffusive behind the loudspeakers and absorbing the sound behind the listener. Rather than a closed box the room should be thought of as a waveguide. The sound from the loudspeaker end of the room travels towards and past the listener and disappears without reflection. While this ideal may not always be achievable it can serve as a guide of where to provide diffusive and absorptive room surfaces. With this type of room, this type of loudspeaker and listening room setup it is left up to the recorded material to establish the quality of the illusion. First we have a near-field monitor like the Genelec 3-way. It has smoothly controlled and relatively wide horizontal dispersion. The recording engineer sits very close to the speakers so that the ratio of direct to reverberant sound is very high, almost like with headphones, but without the in-head localization and spatial distortion of headphones. Since these are relatively small speakers it can be difficult to judge the proper bass balance of a recording. The speakers have built-in power amplifiers and active equalization and crossover. The MEG studio monitor is a 3-way. It is a cardioid up to about 200 Hz from where the forward directivity of the large woofer driver takes over. Thus the speaker’s directivity increases less between low and high frequencies. In an acoustically dead mixing room with RT60 of 250 ms they are effective tools for music production and popular with Tonmeisters in Germany. 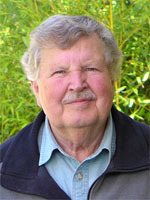 The JBL M2 exemplifies the work of Floyd Toole about loudspeakers and rooms. It has wide and controlled dispersion, low non-linear distortion and high dynamics. But it is also ported like the Genelec. These monitors are designed for work in rooms with dead acoustics, not what we typically have in the home. These monitors are analytical tools for making recording decisions and not used for music enjoyment at home with its wide range of room acoustics. 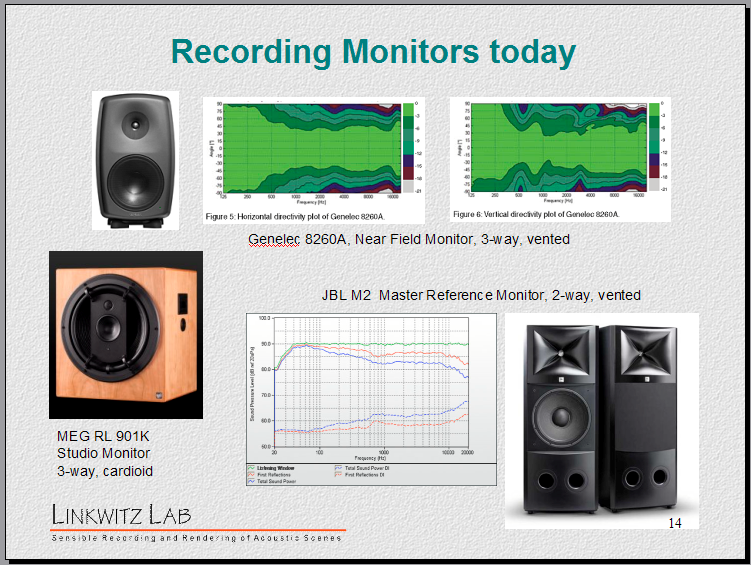 It is certainly possible for experienced recording engineers to make excellent recordings using these types of monitors. >> How such recordings are rendered in the home depends upon the loudspeaker and the listening room, which is typically not especially designed for audio reproduction. 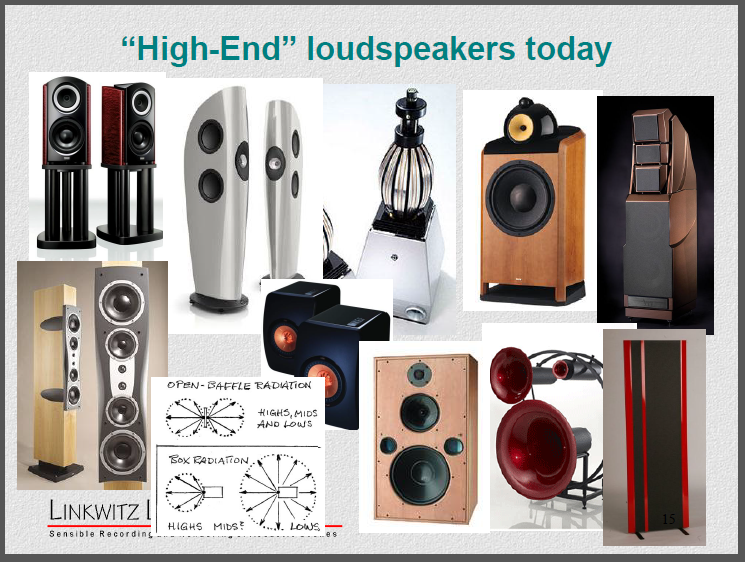 Here are 10 examples of highly rated loudspeakers, which are representative of the "high-end" today. All are very pricey except for the small KEF LS50 two-way speaker in the center. There are some real engineering marvels amongst these speakers, like the MBL Radial Strahler. It is the only speaker amongst these that has constant directivity at all frequencies. Horizontally it is omni-directional – as in this graph - and thus would meet my criteria for a high sound quality speaker, but unfortunately it has vented ports for unnatural bass enhancement. Besides, some directionality, like in a dipole or cardioid, is advantageous because it increases the direct to reverberant ratio at the listening position. With the exception of the horn speakers and the Magneplanar open-baffle radiator, all speakers here have ports. Also all use passive crossovers and external power amplifiers. The Magneplanar uses large radiating panels and a long high frequency ribbon is not an acoustically small radiator and therefore has radiation lobes. It makes its interaction with the room difficult to predict. It also suffers in bass volume capability. Never-the-less it comes close to my ideal loudspeaker concept. The horn loudspeakers next to it are highly directional, but their directionality varies considerably with frequency of radiation. They are multi-beamers. Thus the reverberant field in the room is relatively weak for most frequencies. To me they sound like big headphones at a distance, creating a phantom scene that is uncomfortably close and colored. The TAD 3-way and KEF Blade use a coaxial design of midrange and tweeter, which gives a smooth transition in the polar pattern between the two transducers and a smooth roll-off in the off-axis response as the speaker becomes increasingly forward directional with higher frequency. Again, they are omnis at low frequencies. Both speakers and most others hereuse strategically placed internal bracing to minimize spurious radiation from the enclosure surfaces. All the box speakers here must deal with the acoustic cavity behind the cone and how to dissipate the airborne energy that should not be re-radiated into the room. The B&W 801 speaker goes for wide horizontal and vertical dispersion and low diffraction with its spherical midrange and tweeter baffles. But it does not go far enough to produce a neutral sounding reverberant field in the room. The Dynaudio loudspeaker with its symmetrical vertical driver arrangement achieves a narrow vertical radiation pattern, but possibly with lobing. The Spendor box speaker continues in the BBC tradition of monitor design and has in my opinion a host of cabinet and diffraction issues. 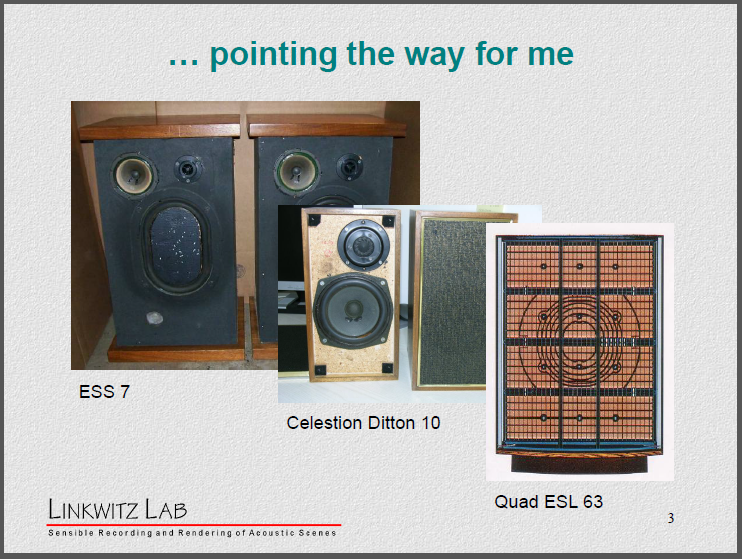 Again it really exemplifies what is wrong with the box loudspeaker paradigm and its generic loudspeaker sound. The best recognized of this type of box speakers is probably the Wilson line of speakers, to the point of having become status symbols. >> So, whatever happened to the quality of reproduced sound in the home? By quality I mean: How close have we come to creating the illusion of a live acoustic event in the home? 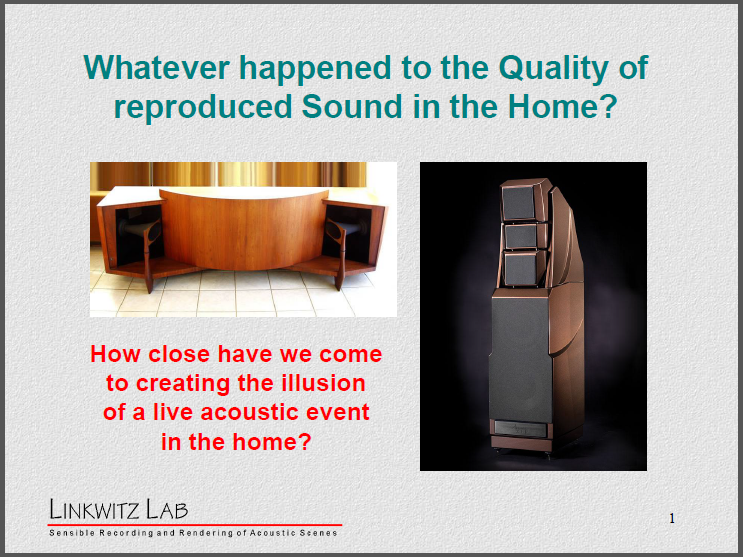 16) Whatever happened to the quality of reproduced sound in the home? the quality has improved due to CAD design & test . But computer design models have limitations in how accurately they represent reality and in what they leave out. Vented box designs dominate. They produce a generic loudspeaker bass character. Active loudspeakers have low customer acceptance though they give greater design freedom than passive crossover/equalizers and could improve the quality of speakers. Practical listening room requirements have not been established. 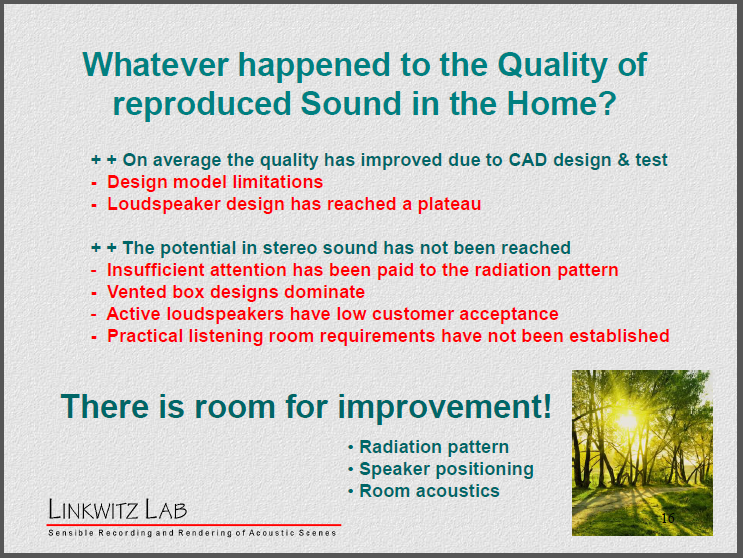 The audio industry has provided little guidance to the consumer on room acoustics and speaker placement. +++ There is room for improvement! We have seen great technical advances in the last 50 years that have changed what is possible in audio recording and rendering. Loudspeakers are an old and almost mature technology. Loudspeakers have followed the call of marketing in selling subjective sound rather than following technology in improving the realism of the sound experience. I was just fortunate that I could built for myself, what pleased me and without obligation to someone else. But what I have talked about here, what more could be done with loudspeakers and rooms, is disruptive to long established procedures and beliefs. It may never become a commercial success. But one can hope that the full potential in stereo will become recognized. Think about it, two information streams are all that the ear and brain need for orientation in auditory space, provided that the ear signals change properly with head movement. That is what two loudspeakers will do for you. Thank you for giving me this opportunity to talk to you. You are the ones who can make higher quality audio a reality! "Day one ended with ALMA's festive Driver Award Banquet. 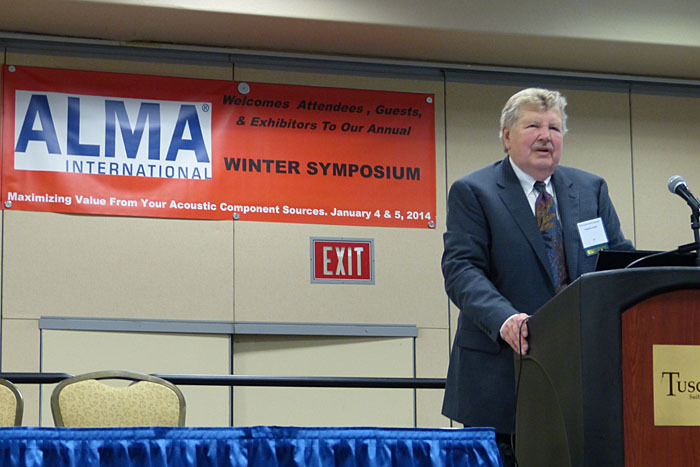 Siegfried Linkwitz delivered an exceptional keynote address and thought provoking challenge to the industry leaders, CEO's, and design engineers (as well as those who missed out on this opportunity): loudspeaker development has reached a plateau and needs to return to the goal of attaining realism. The challenge was found to be inspiring and met with renewed enthusiasm and much discussion during the ensuing cocktail hour."